Gentian root and other highly bitter plants have been used for centuries in Europe as digestive aids (the well-known Swedish bitters often contain gentian). Other folk uses included topical use on skin tumors, decreasing fevers, and treatment of diarrhea. Its ability to increase digestive function, including production of stomach acid, has been validated in modern times. Gentian root contains some of the most bitter substances known, particularly the glycosides gentiopicrin and amarogentin. The taste of these can be detected even when diluted 50,000 times. Besides stimulating secretion of saliva in the mouth and hydrochloric acid in the stomach, gentiopicrin may protect the liver. Gentian root is also considered useful for poor appetite and indigestion according to the German government’s Commission E monograph. It was considered especially useful in states of exhaustion from chronic disease and in all cases of debility, weakness of the digestive system and lack of appetite. It was also considered one of the best fortifiers of the human system, stimulating the liver, gall bladder and digestive system, and was thought to be an excellent tonic to combine with a purgative in order to prevent its debilitating effects. Gentian root can be taken as a tincture (1–3 grams daily), as a fluid extract (2–4 grams daily), or as the whole root (2–4 grams daily). Gentian root should not be used by people suffering from excessive stomach acid, heartburn, stomach ulcers, or gastritis. 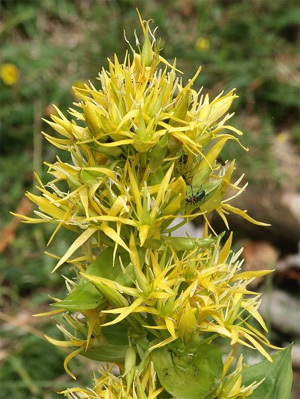 At the time of writing, there were no well-known drug interactions with Gentian. This plant comes from meadows in Europe and Turkey. It is also cultivated in North America. The root is used medicinally.